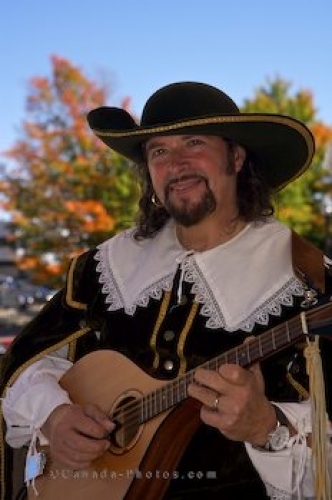 Quartier Petite Champlain in Old Quebec, Canada is a very popular location for tourists and this mandolin player dressed in costume entertains the people daily during the summer months. The mandolin has its own unique sound and many people love to relax with a coffee listening to this musician perform while visiting Quebec City. Mandolin player, Michel Jerome, along Rue du Petite-Champlain in Quartier Petite Champlain in Old Quebec, Quebec City, Quebec, Canada. UNESCO World Heritage Site. Picture of a mandolin player entertaining the crowds in Old Quebec, Canada.